Hello, and welcome back to our blog here at Oak Disposal. 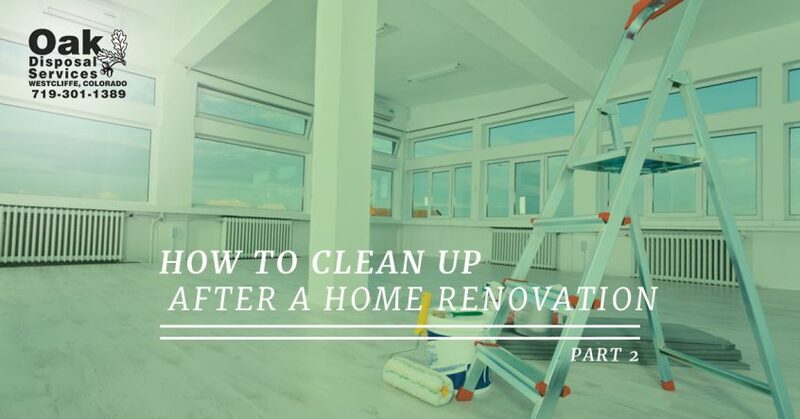 If you keep up with our blog, you’ve probably read our post titled, “How To Clean Up After A Home Renovation.” If not, you can read it here. Last time, we talked about planning your cleanup ahead of time. For example, if you know how big your project is going to be, and about how long it will take, you should determine what cleanup work can be done during the renovation process and what needs to wait until after. You should also hire a professional cleaning company that will help you dispose of certain materials and eliminate harmful allergens from the room. Keep reading to learn about several more tips on cleaning your home after a renovation. If you had to do any painting or varnishing during your renovation project, you need to give the room or rooms time to clear out before you start cleaning them or using them. It’s tempting to start using a room immediately after renovation because you’ve likely been waiting months to start using it. However, it’s not healthy to inhale the fumes created by paints and varnishes. This can lead to headaches, dizziness, and nausea. You should open all the windows in the room that you’re renovating, as well as turn on your HVAC system before the project begins. That way, air will continue being circulated and keep the harmful fumes out during the process. Use your best judgement to determine when you should start using the room again. If there is still a pretty strong smell coming from the room and you get a headache from being in there too long, you should probably wait more. You know those giant dumpsters that you find sitting outside a construction site? Well, those aren’t just for major construction projects, those can be used for residential renovation projects as well! The great thing is, these dumpsters will cut down on your cleanup time significantly, whether you’re doing all the cleaning yourself or leaving it up to a professional cleaning company. Construction dumpster rental has several major benefits over regular trash pickup in this situation because you won’t have to wait for your pickup day and you’ll be able to hold a lot more debris than in your regular dumpster bins that you take to the end of your driveway everyday. Once you’ve loaded the dumpster, your disposal will come back and take it all in one trip, out of sight and out of mind for you and your family. Oak Disposal has been serving the Wet Mountain Valley for over 20 years. If you’re performing a renovation on your home, we would be glad to deliver a construction dumpster to your home. Once you’ve filled it, just give us a call and we’ll take it off your hands. If you’d like to learn more about our weekly trash pickup, construction dumpster rental, recycling, or porta-potty services, contact us today!